You live with your family in Milan, Italy, where you were born and raised. You grew up hearing tales of the Black Death wiping out entire towns in the late 1300’s. It was said that the world had lost a third of its population by the year 1400. And there you were, centuries later, feeling just as helpless as your ancestors had. You are still in mourning for the recent loss of two of your cousins who probably were exposed to the Black Death at Carnivale in February. They died within a week of the celebrations. Rumor has it the baker and his family are in mandatory quarantine. Your friends and neighbors are disappearing one by one and it is anyone’s guess as to where they fled or if they are even still alive. Shops are closed, the churches are empty and food supplies are starting to run low. You are terrified. The sun is starting to set and movement outside the window catches your eye. Walking slowly down the street is a foreboding figure dressed in all black, the coat or gown nearly reaching the ground. A wide-brimmed hat, also black, rests on his hooded head. In his gloved hands is a wooden stick. But the most frightening feature of all is the terrible face. His eyes are large glass domes and his nose is long and pointed, like a raven’s beak. The plague doctor. His arrival could only mean one thing: the Black Death is nearby. Little do you know that by the end of the next year, over 60,000 Milanese will perish. Nearly half of the city’s population in 1631 will be gone, including a good portion of your family. Venice will lose 30% of its people. Nearby Verona will lose 60%. The very sight of the “beak doctor” chills you to the core. Unfortunately the cloaked figure, a frightening symbol of Death itself, might be your only hope of survival. Plague doctors have existed as long as plague, long before the Black Death tore through Europe in the 14th century. In the Middle Ages, doctors were so valuable that they were paid handsomely and given special privileges. Even though they had little to no scientific understanding of diseases like bubonic or pneumonic plague, they did what they could to prevent its spread and were desperate to find a cure. They were not only responsible for caring for patients during epidemics, but they were also required to keep meticulous public records of deaths and occasionally became witnesses to wills. Plague doctors were also given permission to conduct experiments and research that would normally be banned under any other circumstances. Autopsies were one form of research that was strictly forbidden for religious reasons. During the Black Death epidemic the ban on autopsies was lifted for a select few physicians who showed some promise in understanding and treating the disease. These were desperate times. Still, very little headway was made treating the plague. Doctors often contracted the disease despite their best efforts, and were required to quarantine themselves when they were off-duty. Many would abandon their posts, presumed to have fled. During the worst of the epidemics it was so difficult in some towns to find enough plague-specific doctors willing to step up that government and clerical officials were left with no choice but to hire people with no formal medical training. More than a few plague victims were treated by a former builder or fruit salesman. It is doubtful the patient would have been very comforted by that fact, assuming he or she even knew. Second-rate doctors were abundant and practiced methods that included the use of frogs and leeches to get the evil out. Quackery was definitely not unheard of and there are records of some pretty bizarre types of cures promoted by some of the less desirable “doctors”, typically those with very little actual medical knowledge and training. But there were also very gifted physicians out there, such as Nostradamus and Niall O’Glacian, who were widely respected and made huge strides in medicine. For centuries humans have blamed the spread of disease directly on bad air. This theory of bad or corrupt air causing disease is now referred to as miasma, a term coined in the early 18th century. Miasma was the predominant theory to explain the cause of disease until germ theory began to take over gradually and was solidified in the 19th century with the actual discovery of the germ. Scientific proof supporting germ theory came in the 1860’s and 1870’s with discoveries by Louis Pasteur and Robert Koch. In ancient Greece, Hippocrates wrote that bad air was basically the same as pestilence and disease. In 1348, Master Jacme d’Agramont (a well-known physician in Spain) wrote that most known diseases were caused by corrupt air. The idea that a nasty stench alone could cause disease began to take hold in Medieval Europe, but how this actually happened physiologically was still pretty fuzzy. In 1450, Alberti (a famous Renaissance architect) specifically mentioned the importance of sewers in his writings. The purpose of sewers was obviously to keep poo out of the streets, but perhaps more importantly to preserve the overall quality of the air to avoid spreading disease. Physicians were generally in agreement that bad, corrupted air caused disease, but they disagreed when it came to the actual cause of the corruption. Explanations varied from decaying corpses to earthquakes to planetary alignment and the wrath of God. Miasma was the go-to theory in the medical world for the next couple of centuries. When it came to the Black Death, the miasmic theory stated that not breathing the corrupted air would prevent the plague from affecting you. To learn more about the Black Death’s symptoms and how it actually spread (hint: not via “miasma”) click here. Until recently, the Black Death was assumed to be the bubonic plague, which was probably spread by fleas. However, new evidence points to the Black Death actually being a pneumonic plague, an extremely contagious viral disease, meaning it was actually airborne! Maybe the medieval doctors were on to something? Read about it HERE. Charles De l’Orme was an extremely charismatic, intelligent and influential physician who served as the family doctor to French and Italian royalty. He lived to the ripe old age of 94, an incredible feat in the 17th century. His age gave him the appearance of being wise and his apparent good health instilled much confidence in his patients. In 1619, a 35 year-old Charles wrote about a costume meant to protect doctors (himself, specifically) from contracting the plague on patient visits. Because no other previously written mention of the costume has been found, Charles is credited with its design. The costume consisted of a long overcoat or gown (neck to ankles), breeches, leather gloves, boots and a hat, all waxed and water-resistant. The overcoat was tucked under a mask that had glass domes for eyes and a long beak-like cone. If worn correctly, not a sliver of the doctor’s skin would be exposed. The overall look of the costume was perhaps a bit on the dramatic side, but that didn’t stop it from quickly gaining a place in Italian culture. Mask designs could vary depending on the location and doctors’ resources. The long black overcoat, or gown, was made of leather and covered with wax or suet (a hard, white animal fat). The purpose of waxing the coat was most likely to prevent bodily fluids from sticking to it. The neck of the coat was tucked into the mask to cover up the bit of skin showing between the mask straps and the doctor’s undershirt. A doctor needs to wear pants! The breeches were vital to preventing exposure to the lymph nodes around the legs and groin area. Lymph nodes were often the first to become infected with the plague, so doctors took care to keep them covered. Like the coat, breeches were also made of waxed leather. Hands and ankles were required to be covered. These items were usually waxed as well. Doctors at the time typically wore wide-brimmed hats. It was a sort of uniform, like a chef’s hat, which was more symbolic than functional in nature. 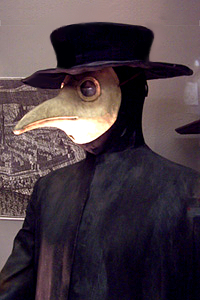 Plague doctors also wore the hats to identify themselves as doctors. 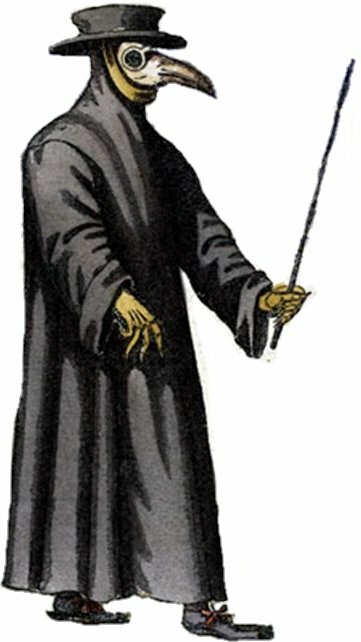 If a hat was not worn, the doctor instead wore just the hood to be sure there was no skin or hair exposed around the mask. The most important piece of the costume is also by far the creepiest. The mask was held tightly against the black hood with leather straps to keep any bad air from sneaking in and poisoning the doctor. The eye holes were cut into the leather and filled with glass domes. The beak was filled with a variety of herbs, incense and other scents to fight against the corrupt air. Some of the concoctions included myrrh, camphor, rose or other flower petals, amber, mint, cloves and storax. Sponges soaked in vinegar were also popular. Anything that smelled strong was considered a viable option to protect against the plague’s miasma. Since miasma was still a pretty elusive and unscientific theory, the herbs and other aromatic items in the beak were also believed to drive away evil spirits. For some, corrupt air was an evil spirit. Contrary to common belief, doctors did not carry sticks around to beat away the rats. The wooden stick (or cane) was there to examine the patient without touching them. It was used to lift bed sheets and direct other members of the household, among other things. So did the costume actually work? Who knows? It’s still unclear how many doctors actually wore this costume and how many of them, if any, became ill or died after wearing it. Based on what we know about both the bubonic and pneumonic plagues, it is doubtful the mask helped all that much. Regardless, the idea behind it certainly influenced future medical practice in Italy and throughout Europe. 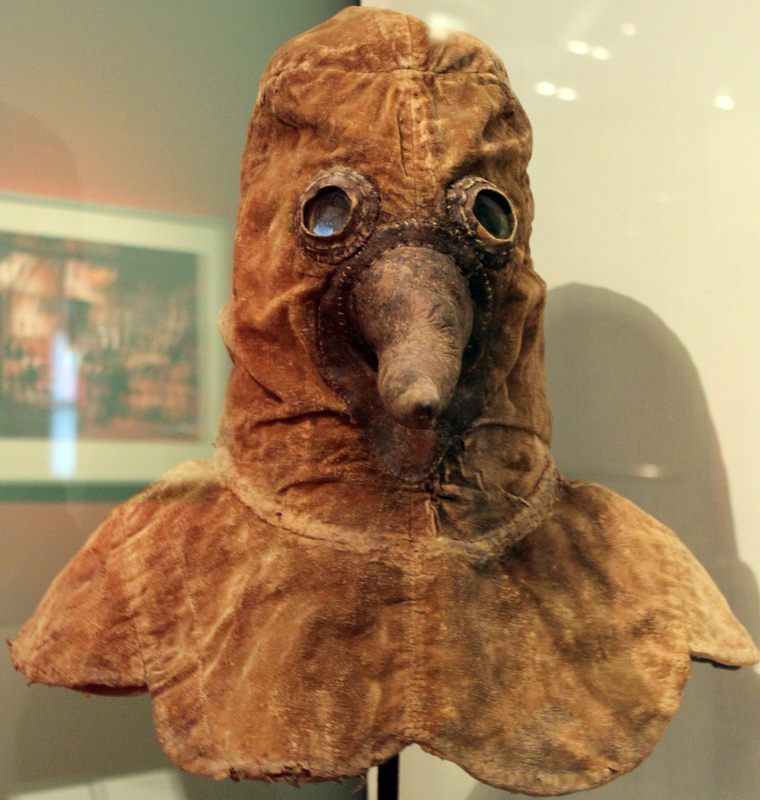 The plague doctor costume lives on not only as a precursor to the modern biohazard suit, but also as a terrifying symbol of death in the 17th century. Sterner, Carl. A Brief History of Miasmic Theory. Anatomy of 14th Century Bubonic Plague Biohazard Suits. Note: This article is not the most accurate overall, but I did glean some useful information from it.